For Hayley Thompson-King, the description of the title to her recent release is simple, she feels that Psychotic Melancholia is a ‘Sodom and Gomorrah concept album’ as the themes focus on women’s roles in the Bible. Her emotional pain takes on physical qualities as Hayley associates ‘living with you is like being “Dopesick”’, puts a smoldering burn to stoke the Country sway under “Old Flames (Can’t Hold a Candle to You”, goes deep for the heat of “Soul Kisser”, and pounds out a rock’n’roll stomp for the rant from “Lot’s Wife”. 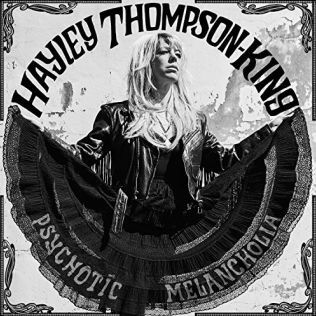 Hayley Thompson-King soundtracks Psychotic Melancholia with fuzz-laden Country Rock, lazily ambling through guitar jangle as she unravels “Melancholia I’ and raises dead memories with the honky tonk rock’n’roll finger pointing of “Large Hall, Slow Decay”. Though she considers herself agnostic, Hayley Thomson-King is still the child questioning religious authority, coming up with her own answers as concept and context for her songs. She thinks back to her youth and finds that it has molded her adulthood recalling that ‘I was the skeptical kid with her hand up in Sunday school. Also, I spent weekends performing with my church youth group called Clowns for Christ. I guess you could say I was obsessed with getting to the bottom of what exactly would send one to hell. I’m still inspired by the questions I had as a kid about disobedience and about the characters I was taught to believe were evil, like Lot’s Wife and Judas and Lucifer. Upon revisiting these stories, I was inspired by their questioning. I thought they were strong and exciting and I could put myself in their shoes’. Psychedelia drapes like a thick mist across Psychotic Melancholia when “Teratoma” dedicates itself to devotion over a tangle of guitar strings. Hayley Thompson-King heads to the garage to tune in and turn up the distortion as she rattles through the rapture in “No Room for Jesus” while she closes Psychotic Melancholia with operatic overtures performed with voice and bass guitar.